Looking for a great guitar bundle to get you off to a flying start? You’ve come to this page at the right time as we made a new 2019 update to our chart! We removed a few older packs, which were no longer readily available, and inserted the surprisingly good Sawtooth ES Series Bundle instead. Learning how to play the electric guitar is one of the best lifestyle choices you could make, and an excellent instrument to dedicate your time to – one that can lead to wonderful things. But to learn the instrument, you need to buy the instrument and that opens the door to a whole new world of questions. Firstly, you can breathe a sigh of relief – if you are a beginner on a budget, buying something like an American Fender Strat and an equally costly premium amp is not necessary. In fact, it could prove to be an expensive mistake if you eventually realize that guitar is not actually the instrument you want to play. Instead, it’s worth opting for a beginner’s guitar or – as I will cover on this page – a convenient and affordable combo pack. One of the most popular packs around with a superb Les Paul guitar. 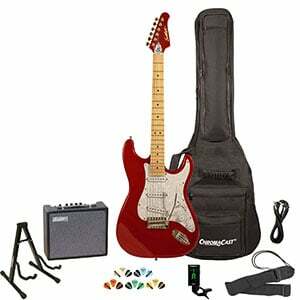 Superb playability and an upgraded amp are the highlights of this pack. Ibanez offer one of the best looking guitar packages on this list! Some unique guitar choices with this affordable kit. Pretty basic and no frills, but super affordable and fun to use. A basic but affordable bundle that’s great for kids! The most affordable complete electric guitar set on the market! Prefer the Les Paul style to a Strat? You’re in luck, as Epiphone offer a quality pack that combines a great guitar, amp, and accessories for an affordable price. The Player Pack – as we mention in our full review – features the Les Paul Special-II LTD, which is a beginner’s guitar with awesome feel and tone. With a solid, Les Paul shaped body, there’s a sturdy maple neck and rosewood fretboard, while the two open-coil humbuckers give the guitar some growl. It sounds great through the included Epiphone Electar 10-watt amp, which gives you enough power and plenty of full, meaty tone you’d expect from Epiphone. The pack also features a quality Epiphone digital tuner, as well as a strap, cable, plectrums, branded gigbag, and some online lessons from eMedia. 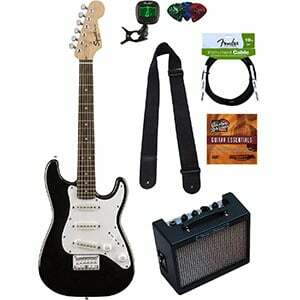 If you’re on a budget but don’t want the settle for the most basic package, this Squier Strat pack is a great option. Slightly more expensive than some others on this list, this pack still boasts solid value for the contents. With Fender’s iconic Strat design, the guitar sports a beefed-up pickup combo – featuring a humbucker and two single-coils – making it versatile for most styles of music. The amp is a Fender Frontman 15G, which packs more punch and tone than the more basic models, with 15 watts of power and a good range of controls to play around with. Throw in a cable and a strap, and you have a great combo kit. Read our full review of this combo pack for all the details. 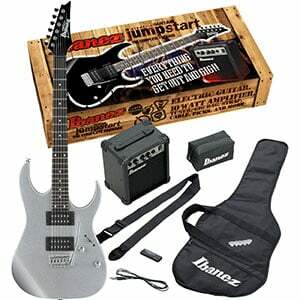 As Ibanez boast on the box, this Jumpstart Package contains everything you need to get out and gig! The guitar itself is fantastic in look and feel – a classic glossy black Ibanez RG body, made from solid poplar, with a bolt-on maple neck, a rosewood fretboard and 24 frets. As we detail in our full review of this Ibanez pack, the guitar sports two Ibanez-designed Infinity humbuckers at the bridge and neck positions, which are great for rock and metal. The 10-watt IBZ1G amplifier in the pack is a little quiet and, contrary to what Ibanez say, isn’t ideal for gigging, but gives you enough volume to practice and jam nicely. The pack also contains a good selection of Ibanez-branded extras, including a gig bag, plectrums, a cable, and a guitar strap. Here’s another convenient kit providing everything you need to get started at a budget price. However, despite the affordable tag, the Sawtooth ES Series guitar that comes with it is probably worth the asking price alone! As highlighted in the main Sawtooth bundle review, there are several surprisingly unique color choices to choose from, with the painted headstocks adding a little extra quality. All the guitars have sycamore bodies, maple necks and three single-coil pickups, with basic but functional hardware. The amp in the kit isn’t as good as others on this list, yet the gig bag and extras are very solid for the price. A great option for beginners! Pyle may not be big a name when it comes to guitars, but their beginner’s electric guitar pack is one of the most affordable on the market, and a good option for those on a strict budget. As well as a good looking Strat-style solid paulownia guitar, with three single-coil pickups and tone controls, you get a compact 10-watt amplifier, with a variety of tone and volume options. 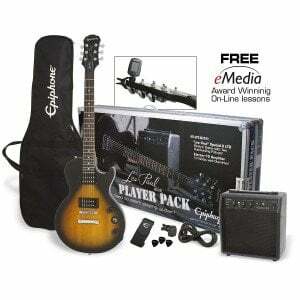 There’s also an accessory pack including a strap, cable, plectrums, gig bag, and a tuner. It’s a no-frills package, but it gives you a stable platform on which to learn your first chords, licks and riffs, at a price that won’t break the bank. Be sure to check out our full review of the Pyle Pro PEGKT15R. Affordable? Yes! Basic? Quite. Great for small hands? You bet! 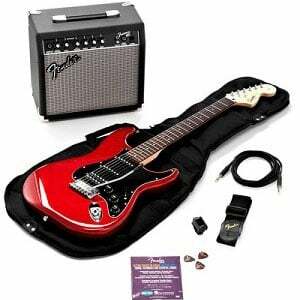 This budget combo pack from Fender’s Squier comes with the compact Mini Bullet Strat, which delivers what the name suggests – a small guitar that looks and plays like a Strat should. It features the classic double-cutaway shape with a hardwood body and bolt-on C-shaped maple neck with a reduced scale length of 22.75” and a petite nut width of 1.6”. It also features the typical three single-coil pickups and simple controls, which are easy for beginners to get to grips with. As we mention in the full review of this bundle, the rest of the items are basic but convenient, including a small amp, a strap, a cable, plectrums and a digital tuner. Whether you have a limited budget or aren’t even sure if the electric guitar is the right instrument for you, then this super-affordable pack could be a very wise choice. With little branding or polish, the guitar – made by a company called Best Choice Products – is actually pretty decent, with a double-cutaway solid body, maple neck, rosewood fretboard and 22 frets, as well as three single-coil pickups with dedicated controls. Not the most versatile, but the small 10-watt practice amp allows you to achieve both clear and overdriven tones easily. 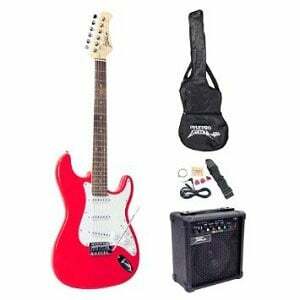 It also comes with a basic accessories bundle including a gig bag, a strap, a plectrum, and a cable. As we state in our full review this kit offers great value and convenience in bucket-loads! If you are buying an electric guitar for yourself or your child for the first time, choosing a beginner’s combo pack is a very smart move. They don’t come with hefty price tags and arrive with everything you need to start playing on the same day. If you try to buy everything individually it can take more time and, usually, more money. Manufacturers know the importance of the beginner market and will offer as much as they can for as little as they can, in order to turn you into a devoted follower. As GuitarFella has shown, you can find some real quality at ridiculously low prices. The first thing to remember in this starter combo pack category is that you generally swap words like ‘premium’ and ‘polished’ for words like ‘convenient’ and ‘value’. But as a beginner this shouldn’t bother you – there’s plenty of time to enjoy the more expensive aspects of the instrument when you can play and enjoy it to a higher standard. That’s not to say that you don’t want to be picking the best guitar that your money can buy. Because you definitely want something that’s comfortable to hold, fun to play, and nice to look at! Firstly, ignore things like body and neck woods – which, in this category, are most likely to be basswood, paulownia, or alder (body), and maple (neck). Your main priority is looking for a shape and color that you like – either single-cutaway (like a Les Paul) or double-cutaway (like a Strat) – and something that feels good to play. Pickups in this category are typically very basic, but a combination of single-coils and humbuckers will give you the most versatility in sound. But don’t worry if you only see one kind of humbucker – at this stage, providing it can make a clear sound, it will be good enough. Besides, it’s the amplifier that will make the most difference to your sound compared to things like body wood and pickups (at this level anyway). Whatever pack you go for, rest assured the amp will be loud enough for practicing and even jamming with other guitarists, although always look out for something with a headphone jack, for quieter practice sessions. As for the accessories in this kind of pack, they too will be basic and – probably – unbranded. They’ll do the job of getting you up and playing, but as soon as you start to develop your skills, you may want to buy a stronger strap and cable, as they can be a little flimsy in this area. The gig bags are usually worth upgrading too, to something that is padded and/or hard-shelled, for ultimate protection. Read our reviews, try some guitars out (if you have access to them), then make a purchase that suits you and check out some good guitar lessons. Good luck and happy shopping!